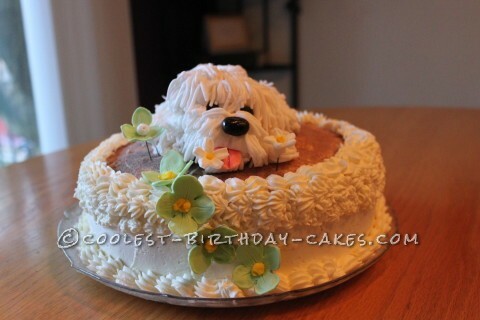 This is the first fondant puppy I’ve made for a cake. I made this for my sister’s birthday and wanted it to be something that she would really love. The puppy is her dog Harley Davidson. I made him out of fondant by forming a large oval for the body and attaching a small oval for the head and then adding a much smaller oval for the nose. The legs are just rolled into logs and bent to shape. 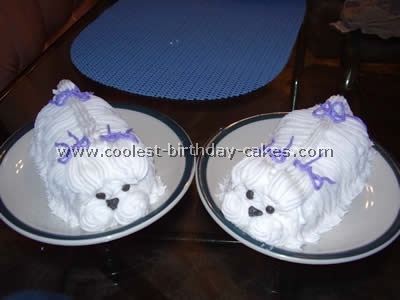 The entire puppy is then covered with rolled strings of fondant by brushing an area with water and then laying the strings into place. I tried to squeeze fondant through a press but it didn’t work as well as I had planned, rolling by hand worked much better. Using a ball tool to make indents where the eyes go and another for the little black nose to sit in. Making the eyes and nose out of black fondant I then glued them in place using water and a paint brush. With a small knife I made a line from the nose down to make the mouth and cut the mouth open a bit to attach the tongue which is just small flat heart shaped piece of pink fondant. The cake is a vanilla cake with a vanilla cream filling. I used a basic white cake and the filling is vanilla cream pie filling mixing with white non- dairy whipped icing. The icing is non-dairy whipped icing. I crushed up some sugar cookies and sprinkled the top of the cake to give the look that the puppy was playing in dirt. I am happy to say that my sister loved her cake and especially her little Harley Davidson. She actually bought a glass case and has him on display. I thinks that;s sweet that she kept him. Did you add anything like any hardener to your fondant icing, or did you just use fondant icing? Did you add anything any hardener to ur fondant icing , or just use fondant icing?